We do! Eclectic Paperie just received a good shipment of Stickles™. Aren't they fun to add a little pizazz, texture and shimmer to your projects? What I love about them the most is that it is a one step process to add to your creations. 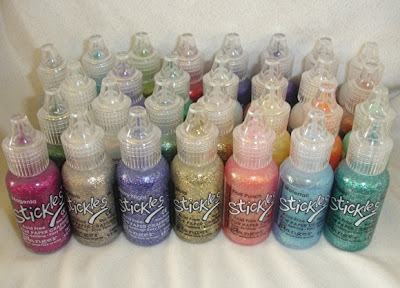 It's glitter and glue in one step. No need to worry about glitter everywhere and on you. It can add dimension just like a liquid lacquer. It's hard to tell but in this photo, I used ICICLE Stickles for the wings on the fairy. It sure beat putting glue on that little area ,then the glitter. But the fairy needed a little shimmer for her wings. Stickles are also great for flower centers, too. If you haven't tried it, you'll have a hard time deciding what color to get. BTW...if you haven't been back to the store in the last few days, we received lots of new things. 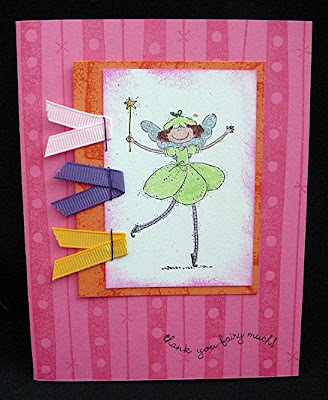 Lil Davis papers and chipboard, Chatterbox Papers, Making Memories velvet brads have arrived. We also have the Bind it All and DreamKutz machines are back in stock, too. Since you have the Sticklers Ranger products, are you going to carry the Ranger inkers with the daubers part of the tubes?